After a fun time in the park, it was time to take Em to her appointment. Of course, I didn’t want to know anything about it, and took the boys out for a walk around the capital city to kill some time. It was a beautiful day! Later in the afternoon we attended a bike jump competition in the inner harbour. The young talent flung themselves off a big scaffold onto huge dirt jumps. All this took place on a floating barge. It was amazing! To me. After the jump competition was over, a young and very talented trials rider did a demonstration in the lower parking lot. He launched himself onto big tree stumps 6 feet in the air, balanced on his front wheel like he was standing on 2 feet, and generally did mind-blowing stunts. The audience stood around and watched like it was no big deal. It was a great performance. I got talking to the trials rider, and he was doing the demonstration for free! WTH? He told me that he was trying to get people interested in the sport of trials, so was doing it to get publicity. He is the 7th best trials rider in the world right now! And he is doing it for free and a major event in BC‘s capital? Why don’t people see this as a major opportunity to see something amazing? I am a long time mountain biker. So to me, the jump competition and trial demonstration were awesome! I would never in my life do what these bikers can do. So why did the audience not really seem too thrilled? They’ve seen it before. Probably many times. On YouTube. TV. Shared in an e-mail. It’s not a shock anymore. Technology brings anything we wish in front of our eyes. This reminds me of a picture I saw the other day on Reddit. Frank Williams. 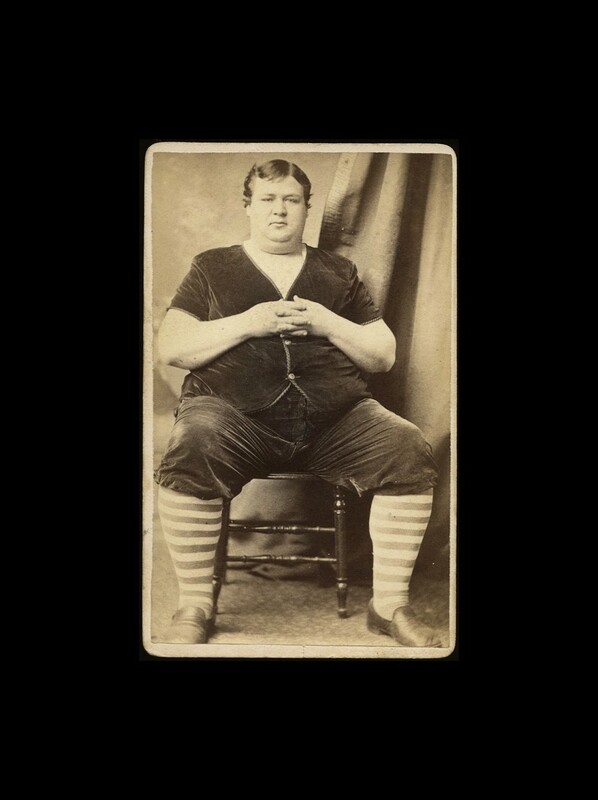 He was SO fat that he was an attraction at the circus! Look at Frank. Ya, he’s fat, but I’ve seen far fatter people wondering an aisle of the Walmart…Is technology to blame for this? Yes. In Frank’s era, there were no TVs, most people didn’t have cars, they didn’t have income that could afford junk food or a grocery store to buy every food item they could ever dream up. They walked everywhere. Or took care of horses to use for transport. They grew their own food. People in Frank’s era worked very hard! Technology has made our lives a hell of a lot easier. That’s for sure. But, is it a good thing? I will sit on the fence and say that it is hard to argue that technology is strictly a bad thing. There are just too many great things that have improved in the world to ignore or reject its benefits. Today however, I saw a couple of things that made me take technology down a couple of notches. Twas a good day, again was glad to hang out. Yes. Too bad we couldn’t meet up earlier…It always seems like a tornado when we make it to Victoria. lol. At least our messy tornado of a house follows up around! Next PostNext Are Computer repairs just as bad as car repairs?